If you venture to the second floor of Belk Library and head toward the vicinity of the DVDs section, you might notice a portrait of a man named Andrew Morgan. This portrait stands out among the others for several reasons: it’s relatively informal, Morgan has a large stature, and he is African-American. Curious about the role that this man played in Elon’s history, I decided to investigate further. Andy Morgan was raised in Alamance County and lived on a farm in Mebane, NC until he was 21 years old. He worked for a textile mill in nearby Glencoe before joining the Elon College staff in 1926. Though he and his wife Hattie Burton Morgan did not have any children, they raised nine of their nieces and nephews as foster children. 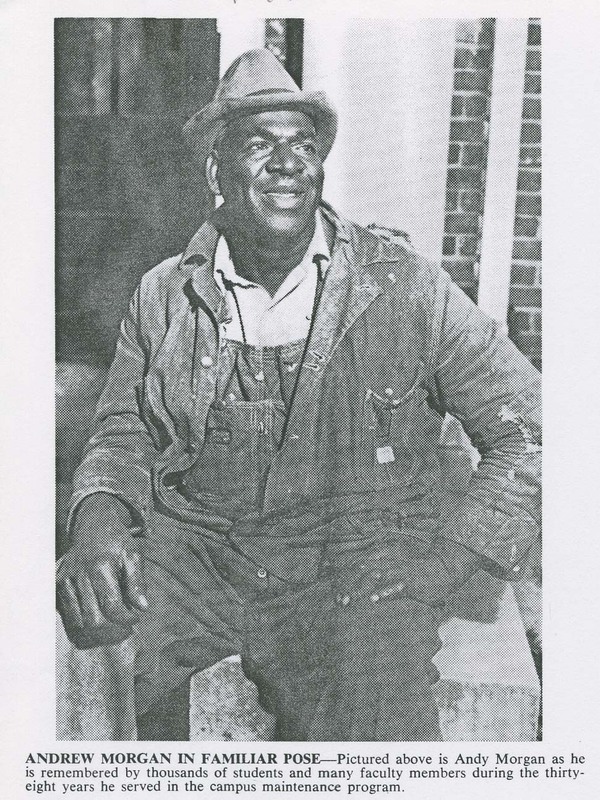 Morgan worked in the campus maintenance department at Elon for thirty eight years, and he became somewhat of a fixture on campus during that time. Former students recall that he was “so so tall!” and report that he knew everyone by name and always had a smile on his face. In addition, he was close with Dr. Danieley’s father and his family. The university community was saddened by Morgan’s sudden death in 1964. While working on the plumbing underneath his home, he was electrocuted and died at the age of 64. His obituary from Elon Alumni News refers to him as “one of the oldest and best-loved employees” at Elon, and many members of the Elon community attended his funeral. The Andrew Morgan Memorial Scholarship was set up in his name following his death. The painting in the library was done from a photograph of Morgan at work at Elon, sitting in his typical spot near Alamance Building.